Lovely map depicting Louisiana, Arkansas, Mississippi and vicinity and labels land then owned by the Choctaw Indian Tribe. 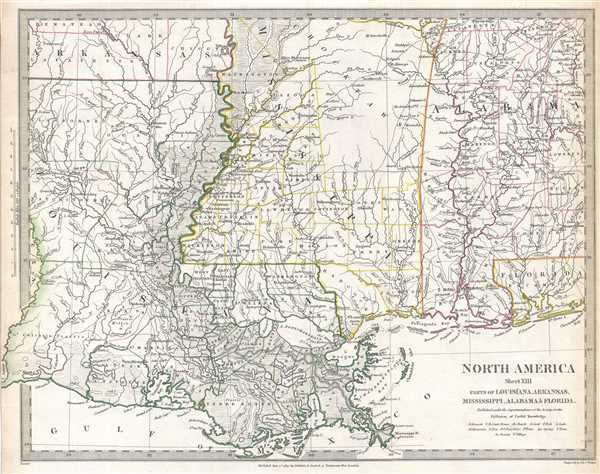 North America Sheet XIII Parts of Louisiana, Arkansas, Mississippi, Alabama and Florida. This is an uncommon 1833 Society for the Diffusion of Useful Knowledge or S.D.U.K. map of Mississippi, Louisiana, and Alabama, including a major portion of the states of Louisiana, Mississippi and Alabama, along with parts of Arkansas and Florida. The map depicts the region from Lake Sabine and the Sabine river to Choctawhatchee Bay and from Hempstead Country, Arkansas to the Gulf of Mexico. Numerous cities, towns, and villages throughout the region are labeled, along with rivers, lakes, , and other physical features. Counties within each state are illustrated and labeled. Several Indian tribes, including the Choctaw, are identified. This map was created for the Society for the Diffusion of Useful Knowledge, engraved by the firm of John and Charles Walker, and published by Baldwin and Cradock on June 1, 1833.